While it’s not as smug and self-infatuated as Ocean’s Twelve, the latest Ocean caper isn’t exactly a sure bet. Here’s the story. It’s slight so it won’t take long to recap, but the movie’s sluggish pace makes for a somewhat lethargic exercise in high-roller high jinks. Reuben Tishkoff (Elliott Gould, Capricorn One), the Ocean’s Eleven member in the ultra-’70s pop-bottle eyeglasses, finds himself double-crossed by Willie Bank (Al Pacino, Scarface). While building the spiffiest, grandest casino ever to grace planet Earth, Willie decides he wants it all to himself. Since they’re both con artists, it’s not a matter of politely buying out Reuben’s share. Instead, Willie has Reuben sign away his interest in the casino — at gunpoint. The crushing turn of events sends Reuben to the hospital with heart palpitations. With Reuben’s condition in decline, Danny Ocean (George Clooney, Syriana) enlists his gaggle of con buddies to seek revenge against Willie and thereby bring good cheer to Reuben. Willie’s big when it comes to casinos. He’s won an incredible four Five Diamond Awards from the seriously prestigious Royal Review Board and with the newly self-named Bank Casino, he’s looking for his fifth. The opening of this casino, therefore, is the perfect, high-profile time for Danny and the gang to mess things up for Willie. Following in the shoddy footwork of Ocean’s Twelve, this chapter thirteen is equally shallow, albeit with toned down self love. Nonetheless, the characters — and by association, the actors — like themselves so much, they don’t seem to have much regard for the audience. The result is a caper flick that incites yawns and chuckles in equal measure. Since this is a buddy picture among pretty boys and it’s all about appearances in Vegas, judging looks is fair game. It can be said with ease that all the leading lads look alluring. The supporting cast, though, seems less so. 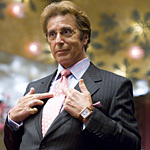 Pacino is sporting a too-tanned skin tone topped off with an odd, virtually matching choice in hair color. As Willie’s main crony, Abigail Sponder, Ellen Barkin (Fear and Loathing in Las Vegas) looks downright faux fantastique, as if she’s been glazed in a Plasticine veneer. It’s OK to be plastic in Vegas but, at least at the Bank Casino, it’s verboten to let your body mass index go and Abigail fires one waitress on the spot for letting her arms get the slightest bit flabby. Eye candy aside, the bulk of the movie involves a couple humorous disguises, nice views of the Vegas strip, and a silly plot involving the Ocean gang (should they be called Oceanographers?) creating their own “artificial natural disaster” like in an Irwin Allen movie, as Linus Caldwell (Matt Damon, The Bourne Supremacy) astutely observes. It would certainly be more fun to be in the Ocean gang than to watch them. That goes double for all the scenes in which one or more of the members is chewing gum or dining on some sort of fine cuisine. Maybe director Soderbergh is going for a sort of cinema verite, but a glamorous celebrity chewing gum is more annoying than artful. It’s also not quite clear what Soderbergh, Clooney and the gang had in mind with some of the movie’s mock social conscience. In one instance, Danny and Rusty Ryan (Brad Pitt, Fight Club) tear up while watching Oprah as she promises to build a new house for her guest. In another case, Virgil Malloy (Casey Affleck, Hamlet) gets involved in a Mexican labor movement, protesting the poor wages and working conditions at a dominos and dice factory. The former seems to be an attempt at having fun with the do-gooder image Clooney and Pitt have achieved. The latter, while somewhat funny, also provokes a sad sense of irony that there are many poor people making props for the rich. As Ocean and the boys hatch their plans, they ask all sorts of questions and look at the numerous potential stumbling blocks along the way (to that end, Eddie Izzard (The Cat’s Meow) is far too serious in his return appearance as Roman, the techno-Brit, when he starts to babble about the casino’s unbeatable security system). Dealing with that security issue and devising an exit strategy become the two biggest concerns for the band of modern-day pirates to address. Unfortunately, writers Brian Koppelman and David Levien, who collaborated on Matt Damon’s Rounders, don’t answer one big question that hovers throughout the movie: so what?